This article was written by Harshita Punjabi, a student of Rajiv Gandhi National University of Law. Before 1956 the property of woman was divided into two heads- stridhan and woman’s estate. The Hindu Woman’s Right to Property Act, 1937 conferred some new rights of inheritance on certain Hindu females which had the effect of increasing the bulk of woman’s estate. Section 14 of Hindu Succession Act, 1956 has abolished woman’s estate. The word stridhan is composed of two words: Stri(woman) and Dhana (Property). The word means the property belonging to a woman or woman’s property. This is the etymological sense but the word has a technical meaning given in law. Thus conjunctively these two words imply that property over which a woman has an absolute ownership. By the authors of different schools and sects it has been used in different senses, yet it connotes a meaning which comes out from the word itself. This term was for the first time used in Smritis and in the Dharmasutra of Baudhayan which meant ‘woman’s absolute property’. In the entire history of Hindu law, woman’s right to hold and dispose of property has been recognised. No woman has been denied the use of her property as absolute owner. The difficulties in deciding as to what constitutes stridhan, arise from the fact that majority of sages and commentators give neither an exact definition nor an exhaustive enumeration, and if Mitakshara gives a simple definition that has been qualified and restricted in its application by our courts, in consequence of its disagreement with the view of other authorities. According to Smritikars, the stridhan constituted those properties which woman received by way of gift from relatives which include mostly movable property such as ornaments, dresses and jewellery though sometimes house or land was also given as gift. The gift made to her by strangers at the time of ceremony of marriage or at the time of bridal procession also constituted stridhan.In effecting Partition if as an absolute gift or interest in a share is given to a woman whether during her maidenhood, marriage or widowhood the same amounts to her Stridhan. Property inherited by a woman becomes her Stridhan or property acquired by a woman by mechanical arts or by her own exertions during maidenhood, subsistence of marriage and during widowhood is Streedhan. Property obtained by a woman by compromise or family arrangement where there is no presumption of her taking only a life interest, becomes her Stridhan Jimutvahana gave different enumeration of stridhan, so did sub-schools of Mitakshara. The saudayika(gifts of love and affection) – gifts received by a woman from relations on both sides (parents and in-laws). The non-saudayika– all other types of Streedhan such as gifts from stranger, property acquired by self-exertion or the mechanical arts. Gifts made at the bridal procession, i.e. while the bride is being led from her residence of her parents to that of her husband. Gifts made in token of love, that is, those made by her father-in-law and mother-in-law and those made at the time of the bride making obeisance at the feet of elders. Gifts made by the brother of the bride. Gift and Bequests from relations- The gifts may be made to woman during maidenhood, coverture or widowhood by her parents and relations, or by husband and his relations. The Dayabhaga school does not recognize gifts of immovable property by husband as stridhan. Gifts and Bequests from strangers- Property given by gift inter vivos or by will by strangers to a woman, during maidenhood or widowhood, constitutes her stridhan. Before 1956 the gifts received from strangers during coverture were stridhan but these were during her husband’s lifetime under his control. On his death these became her stridhan. Property acquired by self-exertion and mechanical arts- A woman may scquire property at any stage of her life by her self-exertion or by any mechanical art. According to all schools of Hindu law, the property thus acquired or maidenhood is her stridhan. Again during husband’s lifetime, it is subject to his control. Property purchased with stridhan- In all schools of Hindu law, it is a well settled law that the properties purchased with stridhan, or with the savings of stridhan, as well as accumulations and savings of income of stridhan constitute stridhan. Property acquired by compromise-In Hindu law, there is no presumption that a woman who obtains property under a compromise takes it as a limited estate. Property obtained by woman under compromise whereunder she gives up her rights to stridhan is stridhan. Property obtained by adverse possession- In all schools of Hindu law, it is a settled law that any property that a woman acquires at any stage of her life by adverse possession is her stridhan. Property obtained in lieu of maintenance- Under all schools of Hindu law, the payments made to a Hindu female in lump sum or periodically for her maintenance and all the arrears of such maintenance constitute her stridhan. Similarly, all movable and immovable properties transferred to her by way of an absolute gift in lieu of maintenance constitute stridhan. Property obtained by inheritance- A Hindu female can inherit property from her parent’s or husband’s side. Mitakshara considered all inherited property as stridhan but Privy Council held such property as woman’s estate According to Bombay school, the property inherited by a woman from females is stridhan. After the coming into force of Hindu Succession Act, 1956, she takes all inherited property as her stridhan. Share obtained on partition- In the Mitakshara jurisdiction including Bombay and Dayabhaga school, it is an established view that the share obtained on partition is not stridhan but woman’s estate. This property is now stridhan after coming into force of Hindu Succession Act, 1956. It was laid down by Privy Council in Devimangal vs. Mahadeo Pd. that the share coming under the possession of a woman after partition is also not stridhan. Even in Mitakshara, property received by a widow after partition is not her stridhan, and after her death it reverts to her husband’s heirs, unless there has been any contract to the contrary. It has also been held in Sham Kunwar v.Wah Kunwarthat where a widow retains her possession for more than 12 years over a joint family property against the heirs, it becomes her stridhan. The Punjab and Haryana High Court in Vinod Kumar Sethi v. Punjab Statehas given an important decision with respect to stridhan. According to this High Court whatever has been received by a bride in marriage or whatever has been gifted to her falls under stridhan. The court divided the gifts and dowry given to her under three heads. First, those items which are given to the bride for her exclusive use; secondly, those which are to be used by her and her husband jointly and thirdly, those which, are to be used by her husband and in laws. Over the first category she has the exclusive right and she is the exclusive owner thereof; over those coming under the second category the court’s view was that by saying that both the spouses have the right to use it will not extinguish the right of ownership of the wife even then. In case the marriage breaks or right of ownership of the wife even then. In case the marriage breaks or right of ownership of the wife even then. In case the marriage breaks or according to the above decision all such gifts and presentations which fall under the first two categories are termed as stridhan. In a later case namely, Pratibha Rani vs. Suraj Kumar the Supreme Court disagreed with the above view of the Punjab and Haryana High Court and held that whatever gifts, presentations and dowry articles are given to a woman in marriage, would be regarded as her absolute property. All the gold ornaments, clothes and other items of dowry given at the time of marriage to a Hindu female are her Stridhan and she enjoys complete control over it. The mere fact that she is living with her husband and using the dowry items jointly does not make any difference and affect her right of absolute ownership over them. The court observed, it cannot be said that once a woman enters her matrimonial home she completely loses her exclusive stridhan by the same being treated as a joint property of the spouses. The school to which she belonged. Alienation- The stridhan being a woman’s absolute property, the female has full rights of alienation. This means she can sell, gift, mortgage, lease, exchange. This is entirely true when she is a maiden or a widow but some restrictions were recognised, if she was married woman. Succession- A new order of heirs was provided under law which included her own heirs upon whom Stridhan devolved after the death of the female. This rule does not apply to the succession of woman’s estate. But now under the Hindu Succession Act, 1956 the distinction between the two categories of property have been abolished and an uniform rule of succession has been provided with respect to stridhan. (i) Adhayagni—gifts given at the time of nuptial fire. (ii) Adhyavaharika—gifts given to bride while going to her husband’s house. (iii) Pritidatta—gifts given to the daughters-in-law by mother and father-in-law out of love and affection. (iv) Patidatta—gifts given to her by her husband. (v) Padvannadanika—gifts given by the elders while wishing them and paying them respect. (vi) Anvadhyeyaka—gifts received from husband after her marriage. (vii) Adhivedanika—gift given to first wife when the second wife was brought. (viii) Shulk—money received for marriage. (ix) Bandhudatta—gifts given by relatives of mother and father. (x) Vritti—money given for maintenance and properties purchased from the money given towards her maintenance. (xi) Yavtaka—when the bride and bridegroom sat together after marriage and received gifts i.e., the gifts given to wife during marriage. (xii) Ayavtaka—those which did not fall in the yavtaka category mentioned above. (xiii) Savdayika and Asavdayika—this kind of Stridhan covers those properties which are received by a woman from her husband, father or at husbands’ or father’s house. The division of, Stridhan by Katyayana into Saudayika and Asaudayika depends upon right of alienation. She has an absolute right over all the Saudayika properties. Over Asaudayika Stridhan the husband too has the right of ownership. (xiv) Paribhashit and aparibhashit—Technical stridhan—Mayukha law divides the Stridhan into paribhashit and aparibhasit categories. The paribhasit one is given to the woman before fire or at the time of her departure for husband’s home. Other properties given to her fall under aparibhashik category. 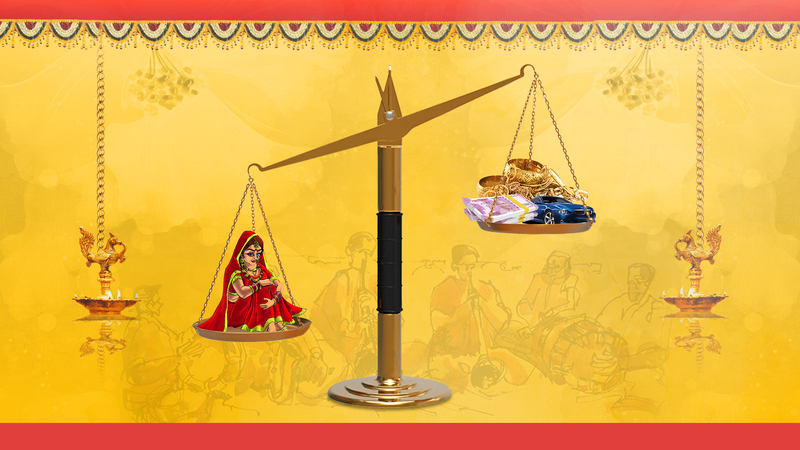 Stridhan different from Dowry- ‘Stridhan’ becomes a necessity of every woman. It is the right of women to claim their wealth any time and use it in whichever way. Stridhan, as the name suggests, is the wealth and other belongings of the woman which she has brought from her parents’ house before, during or after marriage. Stridhan is very often misinterpreted as dowry but both are different. The domestic law perceives dowry as any property or valuable security given or agreed by the bride’s side to the family of the bridegroom before, during or after marriage, by exploiting or threatening the girl or her family while Stridhan is voluntary gift given by members of bridal side to the bride as a stepping stone to establish her own property. There are strict Stridhan laws and the grooms’ side may face stringent action under Section 405 & 406 of the Indian Penal Code, if they deny returning wealth when claimed. Any kind of demand made by the groom or his family, that involves a direct or indirect “deal” in connection with the wedding, is considered dowry. This demand can be made before, during, or after the wedding. It can be cash, valuable security, property or any other favors. It includes anything that is sought either directly by the groom’s family or indirectly through a third party. Stridhan is very often mistaken for dowry even when the law has an entirely different definition for it. Dowry consists of all articles which are given to the groom’s side by the bride’s side in consideration of the marriage, either before or after the marriage. Stridhan involves all articles given only to you by both the groom as well as the bride’s side, either before or after the marriage. Bhai Sher Jang Singh v. Smt. Virinder Kaur, while hearing the case, Punjab & Haryana High Court had ruled that the groom’s side is bound to return back all the items including property, ornaments, money and other belongings offered by the bride’s side at the time of marriage, if claimed. In the case of denial, the groom’s family is tending to get strict punishment. Pratibha Rani vs. Suraj KumarWhile hearing the case, the Supreme Court observed that the complainant had suffered by their in-laws when she was harassed and denied her Stridhan by his husband’s family. The Apex Court observed that the case portrays the plight of an estranged married woman. She even suffered large during the legal process, the court observed. Pratibha Rani was married to Suraj Kumar on February 4, 1972. Rani’s family had given Rs 60,000, gold ornaments, and other valuable items to the Kumar’s family on their demand. But soon after Rani entered her marital home she was started being tortured by her in-laws for dowry. She was forcefully kicked out of her in-laws house with her two minor children and was denied money and other essentials for survival. She had lodged two complaints against her husband and in-laws under section125 Criminal Penal Code and breach of trust. The lower court gave judgment in her favour but she got a seatback from Punjab & Haryana High Court which was later on given in her favour by the Supreme Court. According to Section 14(1) of Hindu Succession Act, Any property possessed by Hindu female, whether acquired before or after commencement of this Act shall be held by her as full owner and not as a limited owner. As per Section 14(2), retains power of any person or court to give limited estate to a woman in the same manner as limited estate may be given to any other person. In Jose v. Ramakrishnan Nair, it has been observed that expressions female Hindu and any property would mean a daughter also. Therefore, limited interest of daughter in the property would also get enlarged to full right after coming into force of this section. Section 14 has been given retrospective effect. It converts existing woman’s estate into stridhan or absolute estate. For this, two conditions are necessary- Ownership of property must vest in her and she must be in possession of estate when the Act came into force. But she has no right in her deceased husband’s property, except the right of maintenance, that property cannot become her absolute property. If a female cannot claim any title to the property, then merely by virtue of her possession, she cannot become its absolute owner. Section 14 does not in any way confer a title on female Hindu where she did not, in fact possess any. Woman’s estate and Widow Remarriage Act, 1856- Section 2 of the Hindu Widow’s Remarriage Act, 1856 provides that the rights and interests which a widow gets from her husband as limited estate, shall cease upon her remarriage and shall devolve as if she had died. The Supreme Court in Punithavalli v. Ramalingam, held that the right conferred by S. 14(1) on a Hindu female constitutes a clear departure from Hindu law and that it is clear that estate taken by a Hindu female under it is absolute one and is not defeasible under any circumstances. However, in Velamure Venkata Sivaprasad v. Kothuri Venkatewarlu it has been held that where a Hindu widow had married prior to 1956 and her limited estate was divested, such estate shall not convert into full estate after the coming into force of the Act of 1956 and her limited estate was divested, such estate shall not convert into full estate after the coming into force of Act of 1956. The Hindu Succession Act, 1956 has abrogated the law relating to Stridhan which existed prior to the incorporation of Section 14 in the Act. Section 14 provided that every property which was in possession of a Hindu female at the time of the enforcement of the Act, whether acquired prior to or subsequent to the Act, became her absolute property. Sub-section (2) of Section 14 of Hindu Succession Act, 1956 lays down that if a gift, will or any instrument, decree or order of a civil court or award grants only a restricted estate to a Hindu female. In absence of such intention, the woman’s grant will be her absolute property. The old law relating to the order of succession has been replaced and new law includes females as well. As per Section 15 of the Act, every property validly in her possession became her stridhan, a full uniform law of succession to such property had become essential. Thus on the death of a Hindu female intestate, her stridhan devolved according to the section 15 and 16. Fifthly, upon the heirs of mother. Property given in lieu of maintenance- A hindu female can also be granted property for her maintenance under a family arrangement, or under a partition. The right of Hindu woman to get maintenance out of the joint family property is an indefinite right yet is it a right. In Palchuri Henumayyayya v. Tadikamalla Kotlingam, the testator had settled property on his wife in lieu of her maintenance. The recital in the will stated that the wife shall enjoy all properties till death and after her death the property will be divided between daughters.In Suba v. Gauranga, a Hindu female was given a life estate in lieu of maintenance under a family arrangement and instrument gave her limited estate. The court held that case under 14(2) and limited estate would not be converted into absolute estate. Under the old law, female took such property as limited holder,unless it was given absolutely. The test was applied by Patna High Court that if a female has no right or interest in the property prior to the grant, she will take it in accordance with the grant, but if she had an interest or right in the property prior to the grant and grant merely embodies that interest , section 14(1) will make it absolute. If Hindu woman is in possession of property other than as limited owner, her estate cannot become full estate after coming in force of Hindu Succession Act. Under an award or decree-In Seth Badri v. Kanso, wherein partition under an award was subsequently embodied in decree, certain properties were allotted to Hindu female as her share, the Supreme Court said that 14(2) did not apply and the word ‘acquired’ has also to be given widest possible meaning. In Bapusaheb v. GangabaiPalekar J. explained context of 14(2) and said that it covers those cases of grants where the interest in the grantee is created by grant itself, where the will, gift, instrument, decree, order or award is the source of interest created in the grantee but if the grant is not the source of interest created but merely declaratory or definitive of right of property enjoyed by Hindu female, S. 14(2) has no application. Under an agreement or compromise- In Mahadeo v. Bansraj, a widow inherited some properties from her husband and later entered into compromise with reversioners that she would hold estate as limited owner. After the Act came into force the widow started constructing house and cutting the trees. The reversioners brought a suit and contended that case fell under 14(2). The court said that compromise acknowledged what was laid down in law and therefore it can’t undo the effect of Section 14(1). In case of Laxmi v. Sukhdevia Hindu widow having no right to share in the property except her maintenance and residence, was allotted some property for residence and maintenance during her lifetime under agreement and expressly prohibited her from alienating properties during lifetime. She was in possession of properties when the Act came into force. It was held that her case was covered under 14(2). In Rajeshwari Pd. V. Shashi Bhushan a widow was allowed a share in her husband’s property under a compromise. On a subsequent compromise decree, her rights were not secured. On her death, her daughter could not claim to represent her. Section 14 of the Hindu Succession Act, 1956 has abolished woman’s estate, yet reversioners are still relevant in respect of woman’s estate alienated by her before June 17, 1956, the commencement of Hindu Succession Act, 1956. The offence under section 405 can be said to have committed only when all of its essential ingredients are found to have been satisfied. As in the case of criminal misappropriation, even a temporary misappropriation could be sufficient to warrant conviction under this section. Even if the accused intended to restore the property in future, at the time misappropriation, it is a criminal breach of trust.If her husband or any other member of his family who are in possession of such property, dishonestly misappropriate or refuse to return the same, they may be liable to punishment for the offence of criminal breach of trust under S. 405 & 406 IPC. In Rashmi Kumar vs. Mahesh Kumar Bhadathe Supreme Court held that when the wife entrusts her StrIdhan property with the dominion over that property to her husband or any other member of the family and the husband or such other member of the family dishonestly misappropriates or converts to his own use that property, or wilfully suffers and other person to do so, he commits criminal breach of trust. Domestic Violence Act, 2005- Section 12 of the Domestic Violence Act, 2005 provides for women right to her Streedhan in cases where she is a victim of domestic violence. The provisions of this law can be easily invoked for recovery of Streedhan. Under the residence orders: Prov. (8) the magistrate may direct the respondent to return to the possession of the aggrieved person her Streedhan or any other property or valuable security to which she is entitled. Again u/s 18(ii) of the Domestic Violence Act the law says that a woman is entitled to receive the possession of the Streedhan, jewellery, clothes and other necessary items. The term ‘economic abuse’ has also been provided under the Act. It includes deprivation of all or any economic or financial resources to which the woman is entitled under al the existing customary laws whether payable at the concern of the court or in any other manner. These resources are however not limited to the household necessities of the aggrieved person. A Bench, led by Justice Dipak Misra, said a husband had only a qualified right over a woman’s ‘streedhan’ — the right to use it in times of distress. The court clarified the law while pronouncing a judgment on Friday (November 20) in the case of a woman who wanted her ‘streedhan’ back from her husband’s custody after they were judicially separated. In this case, the woman approached the local magistrate to get her ‘streedhan’ back. But the magistrate ruled against her, saying that once she was judicially separated from her husband, she was no more an “aggrieved person” This view was confirmed by Tripura High Court and she then moved to Supreme Court. Justice Misra held that judicial separation did not snap the matrimonial tie. The woman, who had suffered domestic and economic abuse at her matrimonial home, continued to be a victim or an “aggrieved person” under the domestic violence law even after her judicial separation. The woman should make a list of all the gifts and properties received before, during and after marriage from her family, husband’s family, friends and other acquaintances. The woman should keep evidence for all the gifts received such as wedding pictures. Also, ensure that the gifts and their bills are in her name and preserve these bills. The woman should have witnesses – statements of witnesses will be important evidence – for gifts of movables (including jewellery) at the time of marriage. The woman should maintain a separate account in her name for her salary. The woman should get involved in the family financial decision-making and keep a record of bank accounts and the investments made out of her Streedhan. The woman should ensure that the title to the property given to her and those bought from her Streedhan are clear and that the investments made from these assets are in her name. The woman should open a bank locker in her name for storing jewellery and instruments of money, property and so on. There appears to be a certain amount of confusion over the terms “dowry” and “Stridhan”. The purpose behind deeming properties as “Stridhan” was to ensure that The woman had full right over its disposal or alienation.On her death, all types of Stridhan, devolved upon her heirs. The husband of the woman had the limited power to use or alienate the “Stridhan” and that too only in cases of distress or emergency and even in such cases, he was obligated to return the same once the emergency period was tided over. Thus the conclusion is that all types of Stridhan are properties given to her by way of gifts and without any “demand, coercion, undue influence or even pressure”. The differentiation of the two terms is towards ensuring that in case of the future breakdown of marriage the woman can at least retrieve gifts received as Stridhan. Thus even if at the time of marriage or during the marriage “gifts” should be given under the cover of “Stridhan” so that she will at least have a right to claim them back. A woman has inalienable right of Stridhan, and she can claim it even after separation from husband. In a ruling the Supreme Court has said that denial of stridhan would amount to domestic violence, and husband and in-laws would be liable for criminal prosecution. The minority judgment in Pratibha Rani’s case was given by the J. Vardarajan. He was of the opinion that under the present scheme of laws there is no separate agreement and also there is an absence of concept of specific entrustment. Therefore it becomes difficult to draw a clear demarcation whether the property has been given to the husband for simple entrustment of custody or it is for dominion. As such it would be unwise to attract the stringent penal provision when at the same time there are sufficient civil provisions to deal with such cases. The women protective laws have now become a handy weapon for many women to blackmail, harass, humiliate and falsely implicate the innocent members of the in-laws family in dowry demand cases and extract money from them before finally setting the marital dispute. Laws like Indian Penal Code, section 498-A and Domestic Violence Act 2005 have number of provisions to intimidate men and their families. Under the Dowry Prohibition Act both giving and taking are punishable offence but no one has been penalized till date for giving dowry. The repeatedly misuse of anti-dowry laws can lead to new legal terrorism that have been made by the Malimath Committee Report. The gross misuses are reported in respect of dowry related I.P.C. provisions. To prevent the abuse of these provisions the Malimath Committee recommended that the sections be made bailable and compoundable to give a chance to the spouses to come together. Deendayal v. Raju Ram, 1970 S.C 1019, per Hedge, j.